WHAT: Following the events of the Red Wedding, King’s Landing turns its attention to the royal wedding between Joffrey Baratheon and Margaery Tyrell, with guests arriving from all over Westeros, including the vengeful Oberyn Martell. Meanwhile, Arya and The Hound continue their journey to the Eyrie; Daenerys Targaryen leads her slave army towards Meereen; Bran and Co. head north to track down the three-eyed raven; and the Night’s Watch prepare for an attack by the Wildlings. WHY: “Game of Thrones” is one of the best dramas on television, boasting rich storytelling, great writing and a massive ensemble cast with nary a weak link among them. But while the exhaustive world building is impressive in both size and scope, it often can’t be fully appreciated until you see how some of the storylines pay off later down the road, whether in future episodes or seasons. What really makes it appointment television, however, and one of the few genuine water-cooler shows left today, is the endless amount of shocking moments weaved throughout George R.R. Martin’s complex fantasy world. (Warning: Spoilers ahead.) Though nothing that occurs in Season Four is as monumental as the Red Wedding from the previous year, the bombshells came faster and more frequent, with several notable characters biting the dust, including heavy hitters like Joffrey Baratheon and Tywin Lannister, fan favorite Oberyn Martell, and quite possibly The Hound, depending on how you interpret his final scene. No other show on television makes you care about the death of a character as much as “Game of Thrones,” and it’s only one of many reasons why the series continues to perform at such a high level, constantly upping the stakes even when it no longer seems possible. 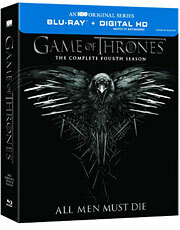 EXTRAS: There are 11 cast and crew audio commentaries spread across the four-disc set, along with an overview of Season Three, featurettes on filming the ninth episode (“Battle of the Wall”) and the role bastards play in the Seven Kingdoms, a roundtable discussion with the actors whose characters died in the fourth season, deleted scenes, a blooper reel and some interactive features. WHAT: Desperate to revive his career, washed-up actor Riggan Thomson (Michael Keaton) mounts an ambitious adaptation of Raymond Carver’s “What We Talk About When We Talk About Love” on Broadway. When one of the actors is injured in a freak accident, Riggan brings in theater luminary Mike Shiner (Edward Norton) as a last-minute replacement, only for Mike’s unconventional methods to lead to a clash of egos between the two men that puts the whole production in danger of shutting down before it even begins. WHY: Alejandro González Iñárritu may not be the most prolific director around, but that hardly matters when you make movies like “Birdman or (The Unexpected Virtue of Ignorance),” a remarkable piece of filmmaking that’s as refreshingly original as it is wildly ambitious. While it’s a pretty incisive satire of Broadway and fame, the movie goes even deeper than that, digging into themes of ego, family and artistic integrity vs. commercial success. More than anything else, though, it operates as a character study of a broken man trying to reclaim his former glory, and in that regard, the film reminded me a lot of Darren Aronofsky’s “The Wrestler.” Some of it is played for laughs, but it’s mostly a profoundly sad look at one man’s struggle to validate his existence. 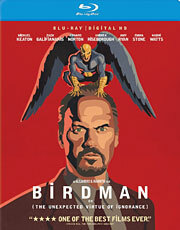 The acting is top-notch across the board – especially Michael Keaton, Edward Norton and Emma Stone – however, the real magic comes from Iñarritu’s decision to stage the movie as one long tracking shot. The balletic precision and sheer ballsiness required to pull that off is mind-boggling, but it results in a more immersive and seamless viewing experience akin to a theater performance, and it’s one that’ll be mimicked for years to come. 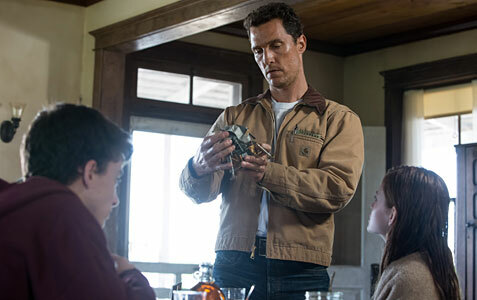 EXTRAS: There’s a fairly extensive behind-the-scenes featurette, a conversation between director Alejandro González Iñárritu and star Michael Keaton about the movie, and a photo gallery. 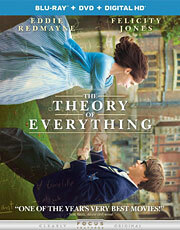 WHAT: While studying at Cambridge in the 1960s, physicist Stephen Hawking (Eddie Redmayne) falls in love with and marries literature student Jane Wilde (Felicity Jones), only to be diagnosed with motor neuron disease and given two years to live. Miraculously, Hawking fought the disease with the help of Jane and went on to become one of the leading minds of his generation. WHY: “The Theory of Everything” is the prototypical Oscar movie. It’s based on an incredible true story (bonus points if the subject is suffering from a disease) and boasts an extraordinary lead performance from Eddie Redmayne. But sadly, the film itself is quite ordinary, falling victim to the usual biopic conventions by trying to cover too much material in too little time. This happens surprisingly often when making movies about real-life people, and it’s especially disappointing here, because Redmayne is simply amazing as Hawking, investing himself completely in the physicality of the role without losing the essence of the character. It’s every actor’s dream job, but for as much credit as Redmayne deserves for the performance, it wouldn’t be as effective without Felicity Jones beside him, because she’s the soul of the film, providing an alternate view of Hawking’s struggle with every heartbreaking and inspiring turn. “The Theory of Everything” is about the power of the human spirit, and while the first half makes for more compelling viewing compared to the generic story beats that encompass Hawking’s later years, Redmayne and Jones are so good that even if their performances overshadow the movie itself, it’s still very much must-see viewing. EXTRAS: In addition to an audio commentary by director James Marsh, there’s a featurette titled “Becoming the Hawkings” and eight deleted scenes with optional commentary by Marsh.